Today we're beside ourselves with excitement as we announce the official launch of custom gift wrap on Spoonflower! As of this morning, you can upload your own design and have it printed on a roll of custom wrapping paper for only $15. Spoonflower designers can also choose to make any of their existing designs available for sale on gift wrap. Those of you who follow Spoonflower probably know that we did a trial run for custom gift wrap in the weeks leading up to Christmas. We've taken what we learned from that trial run and created what we hope is a fully-hatched set of features around gift wrap. The satin finish wrapping paper, for example, is slightly lighter than the paper we offered in the fall. Our custom gift wrap is perfect for creating unique wrapping paper using photos, kids' drawings, or your own designs! It's also great for scrapbooking. You may note that at the moment there is no shopping page for buying your favorite designs on gift wrap. 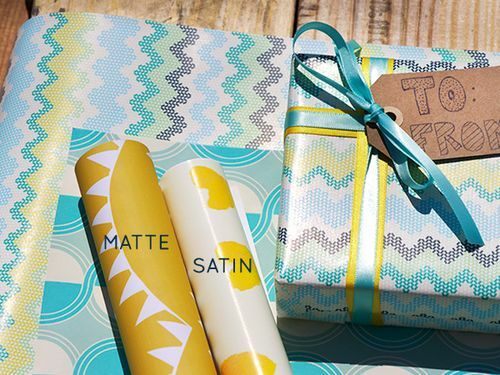 Once the Spoonflower design community has had an opportunity to have a crack at gift wrap and to make a library of designs available for sale, we'll launch the shopping page. It should be up in a week or two! Things are getting back to normal here at Spoonflower HQ and we're really excited today to be bringing you our first giveaway of 2013! Courtesy of the generous folks at Fiskars–and just in time to take advantage of Emma Jeffrey's awesome DIY decal project ideas from a few days ago–we're giving away a Fiskars Fuse Creativity System, valued at $300 US! This new die-cut/letterpress system will let you cut and emboss a wide variety of media, from fabric, felt, corkboard, vinyl, wood veneer, cardstock, and of course, Spoonflower decals and wallpaper, for just about any creative project you can think of! This giveaway will close for entries next Wednesday morning, January 9 at 8am EST, and you're eligible to enter once per day. Please note that simply commenting is no longer a means of entry, and we're sorry that the software service we're using to run giveaways now requires a birth date. Last week's winner of a copy of Modern Quilts from the Blogging Universe and a bundle of her choice of eight Spoonflower fat quarters was Pamella Hartley–congratulations, Pamella!